Do NOT answer questions, consent to searches, or submit to roadside tests. Hire a DUI lawyer ASAP- do NOT defend yourself. Many people think there is no hope of getting out of a DUI charge and their only option is to plead guilty. Even more people believe this is their only option if they’ve failed or refused the blood/urine and sobriety tests. This is not true at all. Never automatically plea guilty for a DUI charge, especially if it is your first case. 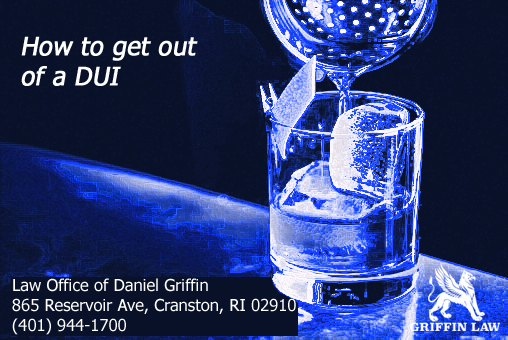 Hiring an RI DUI lawyer is the best option to get out of a DUI charge. There are things you need to know/do before you contact a DUI lawyer so they can have the best possible defense for you. If you follow the guide correctly, you are in a good position to get your DUI case lessened or dismissed. The only thing you have to do is get a DUI lawyer. Do not try to defend yourself. There are too many nuances in the law that only a professional DUI lawyer knows how to use to your advantage. Remember, your job and livelihood are at stake here. The law is nothing to mess with. You need competent and professional defense from people who have studied the law for years and have experience dealing with the courts. Think a DUI lawyer in RI is too expensive? Think again. You could: have your license suspended, fined, jailed, forced to use an interlocking ignition device. Now imagine how much THAT could cost you? It could cost you your job and family. Without a license you won’t have transportation to your job (and might even be fired). And having no job means less money for your family, which leads to arguments and massive stress. Relationships and families can be ruined by a DUI charge. Do not make the mistake of trying to take it upon yourself- you will pay for it dearly. Contrary to popular belief- you don’t save ANY money when you represent yourself. You lose money and a whole lot more. Contact Attorney Daniel Griffin at the Law Office of Daniel Griffin.